After being stranded on my land for hours today, unable to teleport out (thanks Firestorm! ), I decided to do a little marketplace shopping and pick up a message in a bottle kit! I sent out an SOS to the world, and I hope that someone gets my, I hope that someone gets my, I hope that someone gets my.. Message in a bottle! This bottle btw.. is very cute, you can send a real message and place it out for someone special – just 10L on marketplace! I had been to Collabor88 earlier on a mission to find the Glam Affair skins that Serena showed earlier. Such lovely skins at a wonderful price, I picked up Trending 2 for 188L, athough I may have to go back and pick up the other two as well.. and then kick myself for not grabbing the fatpack in the first place. While I was down there at Collabor88, I noticed that they have a wonderful group gift available. The group is free to join, and after you have joined you can pick up The Sea Hole Cassia Glitter Mini Dresses in a fatpack of colours. I am wearing the cafe shade. D!va also has their Marie hair in two versions set out for free at their display in two versions, including a hud that allows you to change the length of the hair and it comes in a fatpack of colours. Categories: accessories, dress, groups, hair, Marketplace, Uncategorized | Tags: 0L, 10L, Collabor88, D!va, F.A.B, fab free, fabfree, fabulously free in SL, freebie, Glam Affair, group gift, Ikon, Love Trill, Marketplace, Second Life, Similar Shoes, sl, sl free, the sea hole | Permalink. Thank goodness it’s Saturday today! It has been one of those realllllllly long weeks, and I am looking forward to climbing into some comfy clothes and vegging for a couple of days before I start the same routine all over again on Monday lol. I’m on my own to find something in my closet in RL, but Bella’s Lullaby hooked me up here in SL! When you join the free inworld group you gain access to a ton of free gift either through VIP gifts, or lucky board prizes. They have recently hit 1500 group members and have place out a special group gift for both men and women. The women’s gift includes the mesh baggy sweater and pink leggings. The Owly Owl Purse is also a group gift and comes with another printed bag (not shown, but also adorable). Lucky Letter L just happened to be on the board when I was down there, and I won these snuggly Ugg Boots too! The Lena Necklace, which I would say is totally unisex is made by .:*LOULOU&CO*:. and is just one of many gifts sitting out at Energy Club. I posted about all of these great gifts months ago, but they are still available, so if you haven’t checked them out – make sure you head down there and have a peek. The Energy Club is free to join. Categories: accessories, groups, jewelry, mesh, other, pants, shoes, skins | Tags: Bella's Lullaby, Club Energy, D!va, Exposeur, fab free, fabfree, fabulously free in SL, free sl, freebie, group gift, Ikon, LOULOU&CO, Love Trill, lucky board, Modish | Permalink. More Avatars Choose Sascha’s Designs! 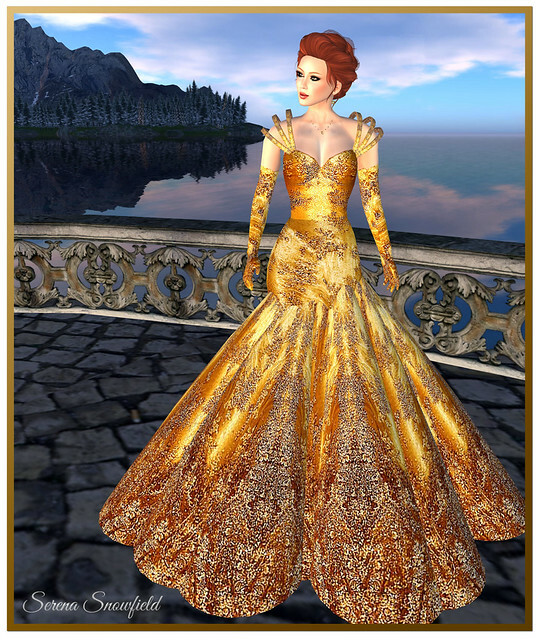 The 2012 Avi Choice Awards were presented last month, recognizing SL residents’ favorite picks in a variety of categories from across the grid. Winning in the Favorite Womens Apparel category (2nd year in a row!) was Sascha Frangilli of Sascha’s Designs. 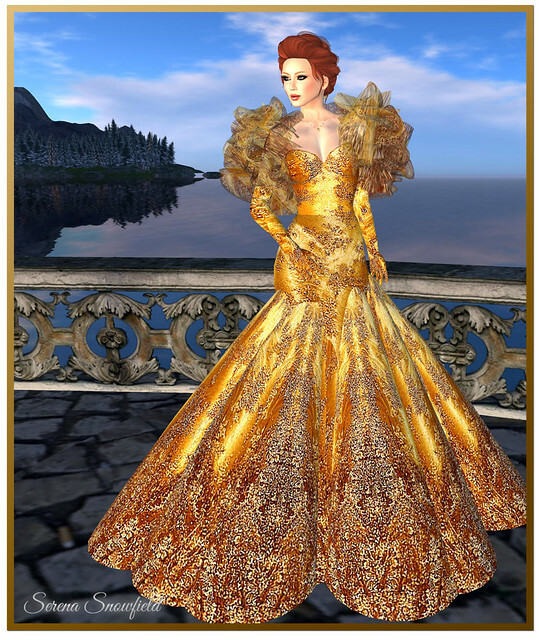 In expression of her appreciation, Sascha has gifted us all with this beautiful, golden Avi Choice Awards 2012 gown. Please note that the gown is free for EVERYONE until January 15, 2013; after that, it will only be free for members of the Sascha’s Designs group. Finally, this look again uses the “fluffer” skirt, this time with both of the triple straps. My skin is the new Renee – Trending skin by Glam Affair, available at the January round of Collabor88 (188L). And since the dress is so spectacular on its own, I decided to go with some simple jewelry. This Gold Smokey Quartz set is by PD/ Mayoness, and is only 1L on the Marketplace (it also comes with a matching bracelet). You can find several versions of this set in just about every color in the PD/ Mayoness Marketplace Store… all for 1L each! Categories: accessories, dress, formalwear, gloves, jewelry, Marketplace, skins | Tags: aDORKable Poses, elikatira, fab free, fabfree, fabulously free in SL, free, Glam Affair, group gift, Ikon, pd/ mayoness, Redgrave, Sascha's Designs, Second Life, Serena Snowfield, sl | Permalink.